Exposure to house dust mites - an avoidable risk factor for sudden infant death syndrome (SIDS) - is not identified in safe sleep guidelines. This article explains why reducing exposure to house dust mites (HDM), and their droppings, is of equal importance to current common-knowledge recommendations. Among the recommendations is to avoid placing sleeping infants on sofas, in parental beds, in bed sharing, on second hand foam cot mattresses or placing them in close proximity to soft toys or loose blankets. Short-term exposure to air polluted by nitrogen dioxide (NO2) such as in traffic fumes. All bedding areas are known as potential nesting sites for a colony of house dust mites if the environmental conditions are still, warm, dark and damp. 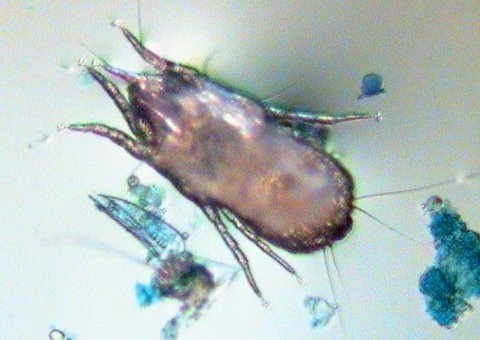 Droppings from house dust mites can be less than 10 microns, and are easily inhaled and are known to cause inflammation in the lungs of vulnerable people. This is an omission that needs correcting because it can result in a public disconnect from the presence of the mite as an environmental risk factor in SIDS. How aggressive is the mite's enzyme? Additionally, research has shown that antigens/allergens from the environment can be transferred to the amniotic fluid to prime (sensitize) T helper cells in utero. (15) Whether the exposure to Der p1 leads to immune tolerance or awareness has yet to be described, but the fact of its presence demonstrates the invasive power of the mite's enzyme. What studies have addressed this? They suggested that failure-to-wake during a life-threatening reaction could dramatically alter the symptoms of anaphylaxis. There would be no coughing, no struggle to breathe, no signs of gross emphysema, with death caused by bronchospasm and asphyxia. They believed that MIA could be the underlying cause for some cases of SIDS. No matter what triggers the final event failure-to-wake is an essential element in this dangerous or deadly scenario. The search for the cause of sudden infant death syndrome continues. Until an answer is found the only recourse is to reduce identifiable risks. Excessive exposure to house dust mites, and their droppings, whether identified as an irritant, or cause of inflammation in the respiratory system, is an avoidable risk factor and must be specifically named in SIDS safe sleep guidelines if the guidelines are to be considered sound. The role of ambient air pollution in Sudden Infant Death Syndrome, 2015, Dr Ian Litchfield, The Lullaby Trust, Grant Holder, 2015.The results indicated ambient air pollutants, particularly PM10 and NO2, were associated with increased SIDS mortality. The two pollutants showed relatively consistent association which persisted across different lag structures and after adjusting for other co-pollutants. Sofas and Infant Mortality, (Article) Rechman LR, Colvin JD, Blair PS, Moon, RY, Pediatrics, October 2014. Conclusion:The sofa is an extremely hazardous sleep surface for infants. Deaths on sofas are associated with surface sharing, being found on the side, changing sleep locations, and experiencing prenatal tobacco exposure, which are all risk factors for sudden infants death syndrome and sleep-related deaths. Laryngeal Inflammation in the Sudden Infant Death Syndrome. Scadding G.K., Brock C, Hamid Q, Current Pediatric Reviews, 2014, Vol.10. No.4. The final event may be acid reflux stimulating the laryngeal reflex resulting in apnoea. Sudden Infant Death Syndrome: Could a healthy infant succumb to inhalation-anaphylaxis during sleep leading to Cot Death? RRA Coombs, WE Parish, AF Walls, 2000, Cambridge Publication. Page 122 (6.2) The larynx as a potential site of fatal airway occlusion is worth further investigation. The loosely attached membrane forms vestibular folds and contains numerous mucus glands. Intrinsic, striated muscle fibres modify the inlet. The larynx is very sensitive and responds to foreign bodies that may cause reflex glottic spasm (laryngospasm) with consequent suffocation, or fluid effusion inducing oedema. Dentate gyrus abnormalities in sudden unexplained death in infants: morphological marker of underlying brain vulnerability. H C. Kinney et al. Acta Neuropathol (2015) 129: 65-80. Sudden unexplained death in infants, including the sudden infant death syndrome, is likely due to heterogeneous causes that involve different intrinsic vulnerabilities and/or environmental factors.